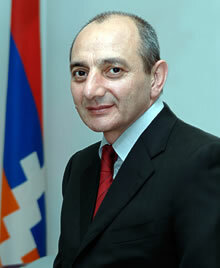 Bako Sahakian was born on August 30, 1960 in Stepanakert, Artsakh. After graduating from the high school, he served in the Soviet Army. Mr. Sahakyan began his working carrier in 1981 as a machine tool technician at the Stepanakert Automated Production Shop. The following year, he was transferred to the Construction Materials Enterprise to be a quarry worker. For the next four years, Mr. Sahakyan worked as a restoration specialist at the Stepanakert branch of the Scientific Department on Ancient Monuments. He then continued as a procurer at the NK Regional Procurement Administration. On July 19, 2012, incumbent President Bako Sahakyan was re-elected for a second five-year term, receiving around two-third of the votes. President Sahakyan is decorated with many orders and medals, including the “Battle Cross” Order of 1st degree, the “Sparapet Vazgen Sargsian” Order, “For Service to Fatherland” Medal of 1st degree and the Russian Federation’s “Peter the Great” Order of 1st degree. He is a Member of the Russian Academy of Security, Defense and Law. Mr. Sahakyan holds a law degree from the Artsakh State University. Bako Sahakyan is married and has two children.